Beat Saber confirms what we all knew: two lightsabers are better than one. But, as fun as dual-wielding laser swords is, wouldn’t it be cool to use them like Darth Maul, too? One player is doing just that. One fan of Hyperbolic Magnetism’s popular VR rhythm game is channeling his Phantom Menace in the best way possible using the ProTube VR peripheral. This adaptable add-on holds your VR controllers and can be twisted and turned to resemble virtual objects. In the case of Beat Saber, though, it just needs to hold one of the two VR controllers at each end. In VR, that gives you two lightsabers stuck together, just like Darth Maul’s. As you can see from the video above, it does make the game a little less practical; Beat Saber’s existing levels are designed with two free hands in mind so it’s not possible to slice every note. But what you lack in high score you’ll more than make up for in feeling like you’ve become one of the most iconic baddies in Star Wars history. We’re sure Maul would be thrilled to learn of his inclusion in VR’s funkiest game if he was, y’know, still alive. Still, with Beat Saber getting its custom level editor, you could now make levels that cater to different styles of ligthsabers. Call me old fashioned but I’d like to try the game with just the trust blue blade. Presenting at VRX Europe, the CEO of studio nDreams estimated there are nearly 15 million monthly active users split across high-end VR, mobile VR and cardboard. nDreams CEO Patrick O’Luanaigh’s talk was framed around Mark Zuckerberg’s goal of getting “1 billion people in VR”, and O’Luanaigh discussed what might make that achievable by 2025. O’Luanaigh said his estimates for the current VR market size come from a variety of sources including analysts and conversations with folks in the industry. Device manufacturers have been publicly quiet about sales figures, though Samsung and Sony shared some milestones. Overall, solid indications of the growth or health of the VR market have been sparse. There has been the occasional indie software developer sharing apps sales figures — like Beat Saber or H3VR — but that only offers a look into a slice of the available market. 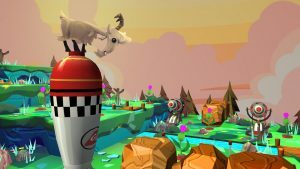 nDreams has shipped a number of VR titles on a variety of platforms, so O’Luanaigh’s figures make for a notable estimate. The monthly active user figure O’Luanaigh shared assumes there is an install base of 4.5 million “High End” VR headsets, 9 million “Mobile VR” headsets alongside more than 12 million cardboard headsets. The figure also bundles in some assumptions to get to the monthly active user estimate, including different percentages of each category headset in use each month as well as a multiple to account for headsets being shown to more than one person. What matters, in my view, is what kind of VR content sells the best, and what kind of VR hardware enables it to do so. “Based on our sales, and the average price points, I strongly suspect that the average high-end user spends more on VR than the average mobile VR user,” O’Luanaigh said. That fits in line with our expectations regarding the increasing immersion and agency experienced in the kind of hand-controlled VR we love on Rift, Vive and PS VR. The estimates, though, also raise questions about just how successful the first generation of standalone VR headsets will be. Is there still time for headsets with pointer-only controllers to expand the market before standalone headsets with full hand controls arrive? The post What You Wear Matters In ‘Reign Of Cthulhu,’ A Lovecraftian AR Adventure appeared first on VRScout. The post ABC’s ‘Royal Wedding AR’ Is An Augmented Experience Fit For A Prince appeared first on VRScout. We’ve been keeping an eager eye on Downward Spiral: Horus Station since the launch of its prologue chapter last year, but now the full thing is nearly here. The zero-gravity adventure, developed by Finland-based 3rd Eye Studios, will be releasing on PC on March 31st with optional support for the Oculus Rift, HTC Vive and Windows VR headsets for $19.99/£14.99. The promised PS4 and PSVR release will come later this summer. You can get a pretty good idea of what the game’s all about in the third developer diary, which was also released this week. Horus Station is a first-person adventure set onboard the titular space station. You explore the deserted facility, trying to uncover what’s happened to the crew. Along the way you’ll gather tools to solve puzzles and navigate obstacles in the environment. Weapons to fight drones and other enemies come as tools previous intended to repair the ship. The game can be played either in single-player or with a friend in a two-player co-op mode. We’re looking forward to Horus Station largely because it looks like a full experience designed specifically around VR (even if the support is optional). It’s not often we see a full story-driven campaign in VR, let alone one that supports cooperative play. We’ll find out if the game lives up to our expectations later this month. Last year, Virtuleap ran the first edition of the Global WebVR Hackathon to champion the open web as the best platform for mixed reality and to rally and catalyze content creators alongside partners like Mozilla, Google, Samsung Internet, Oculus, Microsoft, as well as dozens of other community partners from around the world. We received 34 concepts by teams from across 13 countries, including the United States, the Czech Republic, United Kingdom, Australia, Canada, Japan, Finland, France, Spain, Russia, India, Belgium, and the Netherlands. The concepts were just as diverse, ranging from social VR and templates & tools, to healthcare & medicine and arts & crafts. Next week, the hackathon returns for its second edition and has been rebranded to the “Global WebXR Hackathon” in honor of the forthcoming seismic-shifting upgrade to the WebXR API, a unified framework that welcomes WebAR into the family, allowing developers to create immersive content that runs on all VR and AR devices. This round is sponsored by Supermedium, Mozilla and Samsung Internet, and will run from May 25th to June 24th. It will be much more focused than the last edition; limited to two very different tracks that will be announced on the start date. The prizes will consist of the best and latest VR and AR gear. We have collected a diverse range of industry experts, influencers, and leaders for judges, with a range of backgrounds and skill-sets represented, including developers, designers, devrels, and marketing professionals. You can check out the full lineup on the hackathon teaser page. Getting votes to support your concepts will be important, but we will also be giving brownie points to those creative developers that take advantage of the cross-modality potential that the WebXR API opens up to the industry. So, think bigger and expand your concepts to be accessible to the full spectrum of VR and AR devices. While the hackathon ends on June 24, the party isn’t over then. Virtuleap has partnered with WebXR community pioneer, Damon Hernandez, to pass the baton to the upcoming “WebXR Week” global event that starts the day after, on June 25. We can’t share more details with you yet, but it’s going to be a week-long festival of WebXR learnings and collaborations hosted by WebXR advocates and hubs from around the world. To make sure you stay up to date, follow Virtuleap on Twitter and register for the newsletter on the hackathon homepage. We are super thrilled to see what comes out of this next round and the cross-reality content that it is beckoning all creative developers to manifest on the open web. It is metaversal history in the making. In the latest version of the desktop app you’ll find a new Events section that lets you subscribe to upcoming events like a Winner Takes All tournament in Poker VR or Game Night for Settles of Catan. If you’re on mobile (including the newly-launched Oculus Go), you can find the same section in the Oculus mobile app. Did you know Konami cult classic, Zone of the Enders: The 2nd Runner, is getting another remaster? Well it is, and it’s going to have PSVR and SteamVR support. Judging by the trailer below, that’s a very good thing. For those that don’t know, Zone of the Enders is a mech combat series in which players pilot Jehuty, an advanced combat suit capable of flight, fire and laser sword fighting. The traditional game is played from third-person, Zone of the Enders: The 2nd Runner – MARS, VR support will give you the chance to experience the action from a cockpit view for the first time. There’s also a Very Easy difficulty being added in if you want to just blow stuff up without any worries. Not only that, but there’s all-new content that looks like it’s designed specifically for VR. You’ll get to explore a new hangar environment where Jehuty is docked, for example, and there are 3D model viewers, because of course there is in a VR game. If you’re playing on a standard screen then you’ll also be able to enjoy the game in 4K. The remaster is due to hit PS4 and PC on September 6th. There’s no word on native Oculus Rift support yet but, hopefully, the game will run just fine with the headset through SteamVR. A brief history of immersion, centuries before VR We've never needed Occulus Rift to provide immersive experiences – they've been around for as long as we have. The post VR Locomotion Company, Visospace, Nears Indiegogo Campaign Goal appeared first on VRScout. A city in East China’s Shandong Province is now using VR technology to test the qualifications of its communist party members. If you you’ve been paying even a little bit of attention to the news lately, odds are you may have heard about China’s insane idea to rate its citizens via a Social Credit System. The post Communist Party Of China Begins Using VR In Member Loyalty Tests appeared first on VRScout.